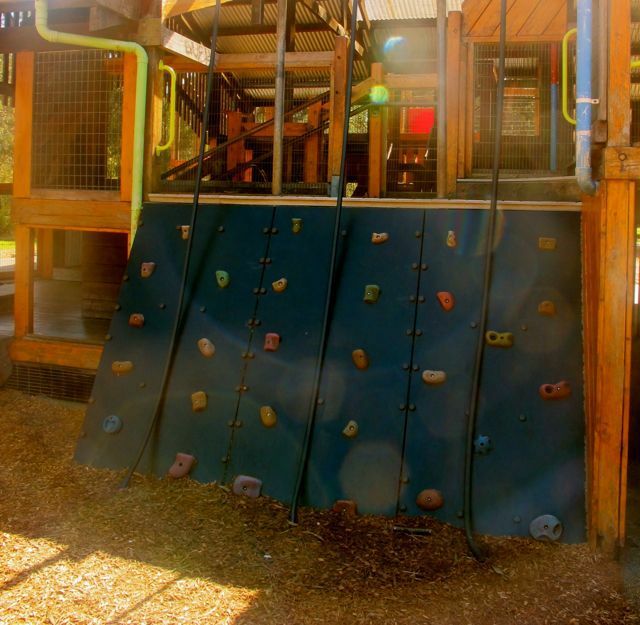 Visit Eltham North Adventure Playground. "Check it out. It's like a MASSIVE cubbyhouse!" Excited children's voices greet my ears when I arrive at the Eltham North Adventure Playground. Set amongst stunning, eucalyptus trees the main play area is built in a massive shed. Inside, it's a bit like a maze with plenty of walkways, steps, tunnels, ladders and ramps leading to play areas. 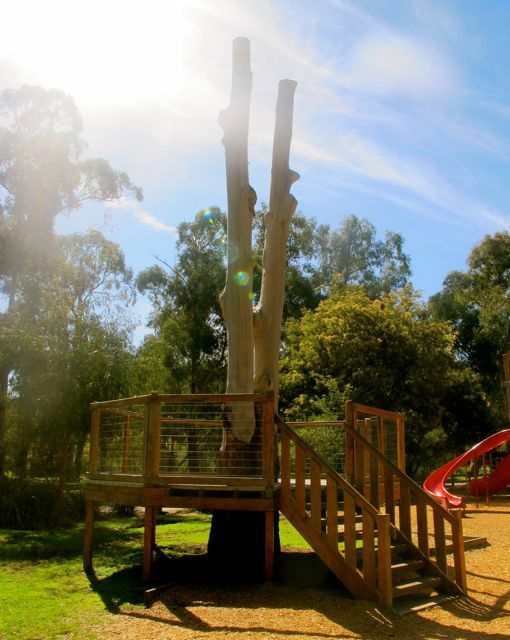 'Fun bits' include a flying fox, springers, monkey bars, a fireman's pole, a climbing wall and balance beam. The area most in demand on the day I was there was the climbing wall, which provides a great way to get in and out of the main play area. The climbing wall on the outside provides an interesting way to get into the main play area. Away from the main play area there is a lookout, a good alternative if the 'massive cubbyhouse' is crowded. The lookout and surrounding swings are a good alternative if the main play area is crowded. 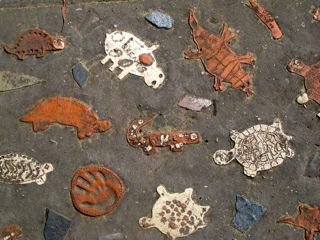 The path which winds it's way around the playground is a mosaic of children's animal clay creations. The path which winds its way around the playground provides the opportunity for animal spotting! 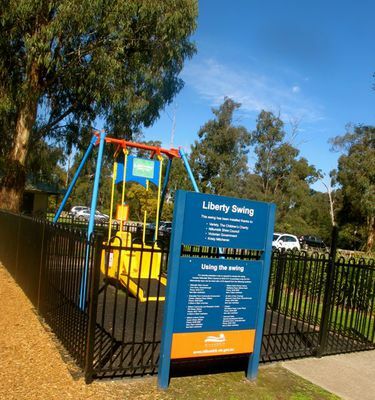 There is a Liberty Swing which is an accessible swing for people in wheelchairs or those with limited mobility. It's locked for security, but you can find out where you can pick the keys up by clicking here. The Liberty Swing at the Eltham North Adventure Playground. The Diamond Creek Trail runs along behind the playground if you feel like going for a walk or a bike ride while you're there. 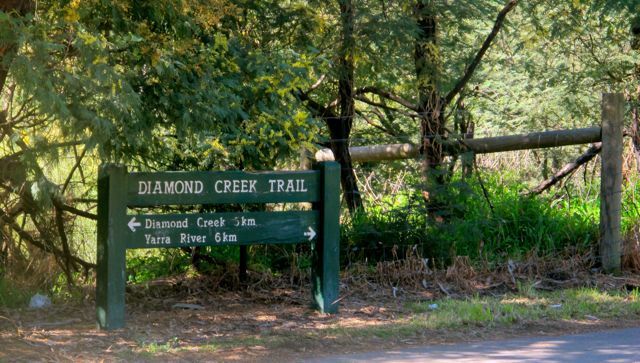 The Diamond Creek Trail provides the opportunity for a bike ride or walk on the day you visit the playground. It's the perfect place for a family day out. The giant 'cubbyhouse' means that there is a sheltered play area if rain decides to visit while you're there. 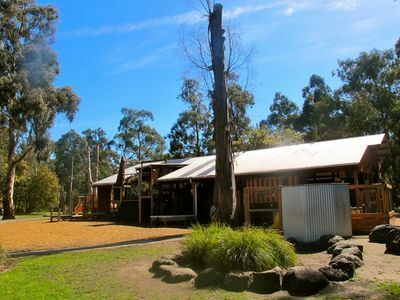 Barbeques, drinking fountains and accessible toilets are provided. When: Whenever the kids need to burn some energy! a great place for a picnic. Pop the kids' scooters or bikes in the car for a pedal along the bike path. Take a frisbee, cricket bat or footy for use on the oval. The link to the key for the disabled swing is broken.